Cablegate did not just reveal secrets, it inspired a new culture of investigative journalism. As the Boeing 777 from London arrived at the gate of Guarulhos International Airport in São Paulo on December 2, 2010, its passengers queued up to deplane, many with the local newspaper under their arm. “Brazil fears terrorism at the 2016 Olympics, says US Embassy” blared the headline of the daily Folha de S. Paulo—a front-page story generated from the first of tens of thousands of classified US diplomatic cables obtained and released by the whistleblower website WikiLeaks. Unnoticed among those passengers was a young woman with a backpack slung over her shoulder. Concealed within a bundle of messy clothing inside her bag was a pen drive containing nearly 3,000 sensitive cables to and from the US Embassy and consulates in Brazil between 2003 and 2010—a cache of documents provided by WikiLeaks. This trove of records covered the two terms of President Inacio “Lula” da Silva’s progressive government and captured the policies, operations and diplomatic efforts of US presidents George W. Bush and Barack Obama, as well as those of the Brazilian government itself, at a time when the country was on the rise as a world-class economic and political power. As WikiLeaks-generated stories appeared in the Brazilian media in the ensuing months, the cables would reveal how the Bush White House curried favor with the country’s defense minister and military, how Bush tried to persuade Brazil to spy on Venezuelan President Hugo Chávez, and how the Obama administration became increasingly uncomfortable with Brazil’s close relationship with Iran. Brazilians would learn some startling details about their own government as well. Beyond the revelations themselves, “Cablegate” in Brazil would have a significant impact on the profession of journalism and strengthen the culture of transparency even as the country was starting to revisit the legacy of its military dictatorship. Brazil was the first South American country to receive the cables—thanks to WikiLeaks founder Julian Assange’s strategic dissemination plan, and to that little pen drive. I was a member of the team carefully assembled by WikiLeaks in the weeks before the initial publication of the cables on November 29, 2010. The goal was to build a network of local media partners in countries rich and poor that would make the stories go global. A task force of independent journalists would review the cables, write groundbreaking stories for the WikiLeaks website, and devise a strategy for other media outlets to investigate and report on the leaked documents. Assange, the product of a cyberpunk culture based on collaboration and data sharing, formed his strategy around that philosophy, balancing it with an acknowledgment of the mainstream media’s traditional demand for exclusivity. WikiLeaks’ original partnership was with four major news outlets—the Guardian, Le Monde, El País and Der Spiegel—that received the collection of 250,000 cables months in advance. A fifth, the New York Times, obtained them from the Guardian. These publications agreed to surrender their exclusive control over the material in January 2011. In the end, WikiLeaks was able to partner with more than ninety media outlets around the world. I was one of the first journalists to reach Ellingham Hall, in Norfolk, England, where WikiLeaks had established its secret headquarters ahead of the “Cablegate” release. For a hectic ten days in November, I—along with other journalists, activists and lawyers—worked secretly around the clock at a table crowded with laptops and cellphones, drafting articles and discussing how to distribute the documents in January. When it came to Brazil, however, time was of the essence. Lula was leaving office at the end of the year, so I argued that any cables exposing his administration should be brought to light as soon as possible. Assange and the WikiLeaks team agreed. Brazil has only a handful of national newspapers, all part of media conglomerates with political and economic interests that influence their coverage of national issues. Indeed, five companies, owned by just six families, control 70 percent of all Brazilian media outlets. “Well, just give the cables to a progressive newspaper then,” Julian told me. “There aren’t any,” I replied. There were, of course, skilled reporters in Brazil who could do a good job, even if we knew some of the stories would be biased and others might never reach the public. I called one such journalist, Fernando Rodrigues of Folha de S. Paulo, and asked if his employers would be willing to cooperate with WikiLeaks. “Yes, we are interested,” he replied. To maintain the exclusivity agreement with the European and US media partners, I explained to Fernando that I would write the stories in advance for the WikiLeaks site and then, appropriately enough, leak my articles along with fragments of the documents to Folha. On November 29, just a couple of hours after El País broke the first cable story, Folha de S. Paulo published the initial WikiLeaks-generated article in Brazil. Headlined “Brazil disfarçou luta antiterror, dizem EUA” (Brazil disguised fight against terror), the story drew from secret US Embassy cables revealing that Brazilian authorities were arresting suspected terrorists but charging them with other crimes so as not to draw attention to their detention. Lula’s government denied the claims, and though the story died quickly, it was picked up by all of the country’s media outlets—newspapers, radio and TV—which were now thirsty for more WikiLeaks revelations. The next day, I decided to run a story titled “My Friend Jobim,” about Lula’s defense minister, Nelson Jobim, and his multiple meetings with the US ambassador to Brazil. It was based on cables that revealed how the Bush administration had pursued a strategy of close contacts with Jobim and the Brazilian military in order to counterbalance the independent posture of the Brazilian foreign ministry (known as Itamaraty). “Jobim continues to challenge the historic supremacy of Itamaraty in all areas of foreign policy,” reported Ambassador Clifford Sobel, calling him “unusually activist” in his defense of US interests. Over breakfast at Sobel’s home, according to one cable, Jobim confided that Itamaraty’s secretary general, Samuel Guimaraes, “hates the United States” and was “actively looking to create problems in the relationship.” It was one of many times that Jobim provided hostile gossip about Itamaraty and the foreign minister, Celso Amorim, to US diplomats. Folha de S. Paulo received the same documents, but it didn’t focus on Jobim’s indiscretions, instead announcing in its headlines that US diplomats saw Itamaraty as an enemy. But my article, and the documents posted on the WikiLeaks website, prompted a series of left-leaning blogs in Brazil to call Jobim a “traitor.” The story then spread to more traditional outlets, creating a minor political scandal. Jobim denied ever having spoken ill of his colleagues in the foreign ministry. Questioned by journalists, Lula said he would believe his own defense minister over the US ambassador. 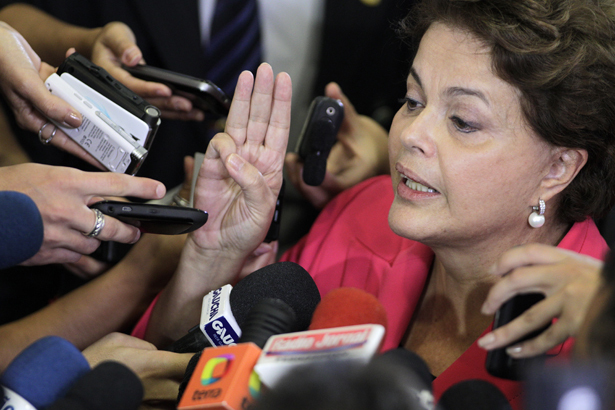 But the story tainted Jobim’s reappointment under Brazil’s new president, Dilma Rousseff. Seven months into her tenure, Rousseff fired Jobim after he publicly made sexist remarks about two female cabinet ministers. He was replaced by Celso Amorim, the former foreign minister so severely criticized by Jobim in the cables. Folha was one of two national newspapers in Brazil that received the cables from WikiLeaks. Deciding with Assange that an additional outlet would foster competition and produce more reporting, we chose O Globo, a Rio-based daily, as the second partner. My challenge was to persuade the two newspapers—both so eager for “exclusivity” and profits—to agree to the arrangement. Folha’s management was not happy, but they complied. On December 5, Fernando and I met in a restaurant in the center of São Paulo with Tatiana Farah, a special reporter for O Globo. The conversation was friendly; we agreed to jointly determine the themes and then write separately about the same cache of documents every day. The trove of records was so rich that we could do this until the beginning of the New Year; afterward, all parties would be free to write about whatever they wanted. While O Globo and Folha selected teams of experienced reporters to write about their areas of specialty, I worked alone, sleep-deprived, in a tiny apartment in the center of São Paulo, trying to keep up the pace of reporting and writing. In four months, I would publish no fewer than eighty articles. Between my stories and those in Folha and O Globo, the WikiLeaks cables produced more than 150 articles related to Brazil. § During the Bush years, US officials repeatedly requested that Brazil take the lead in isolating Venezuelan President Hugo Chávez—even proposing that Brazil engage in espionage against him. In a meeting on March 14, 2005, then–US Ambassador John Danilovitch asked Foreign Minister Amorim to “consider institutionalizing a more intensive political engagement” on Chávez, including “a dedicated intelligence-sharing arrangement.” “We do not see Chávez as a threat,” Amorim replied. § The Obama administration was irritated by Brazil’s relationship with Iran, especially following its attempts to mediate talks about Iran’s nuclear inspections. “The [government of Brazil]…still does not fully grasp the regional and multilateral dynamics surrounding Iran and the Middle East, and its frenzied effort to reach out to all players in the region is increasing the potential for missteps and misunderstandings,” wrote Lisa Kubiske, the chargé d’affaires to the Brazilian mission, on November 6, 2009. By the middle of January 2011, it was clear that the two Brazilian partners were losing interest in the cables and were dedicating less and less space to “Cablegate” stories. I started a blog, which attracted a strong readership. That’s how Phase II of the WikiLeaks coverage—engaging the nontraditional media—began. Rather than deciding myself what to cover, I let the public select issues that were of interest to them. Using the WikiLeaks database of Brazil-related cables, I requested that my readers submit topics to search for in the collection. After conducting a search, I would send the relevant documents to a group of bloggers, who would then publish stories based on them. This generated some interesting articles—revealing, for example, the meetings between US officials and opposition leaders like presidential candidate José Serra, who hinted at a closer relationship with Washington should he win. Neither Folha nor O Globo, who were seen as harsh critics of the Lula government, published any stories about opposition leaders. As the bloggers’ interest in the cables faded by mid-March, with hundreds of documents yet to be reviewed, I and a group of women journalists decided to create Brazil’s first nonprofit center for investigative journalism, called Publica. Based on similar US media organizations like ProPublica, it would publish stories that could be freely reproduced under a creative-commons license. Our first challenge was to review the remaining WikiLeaks documents and see what stories they held. Staffing a temporary newsroom with fifteen volunteer journalists, we were able to publish another fifty articles based on the cables. My favorite new revelation was the secret transfer to Brazil by the United States of thirty Drug Enforcement Administration personnel who had previously been expelled from Bolivia for spying and aiding the opposition. The new stories created another stir in the Brazilian press. But more than that, they proved it was possible for an independent investigative group to match the traditional news outlets when it came to producing professional journalism—and to following the story where the mainstream media would not take it. The impact of WikiLeaks on the Brazilian media community has been unmistakable: within a couple of months, articles based on documents from Brazil’s dictatorship period started popping up in the press. Folha de S. Paulo started its own WikiLeaks-type section, the “FolhaLeaks,” and established an investigative unit in Brasília. More investigative stories are being produced by both the traditional and the independent media. A year later, corporate media outlets such as Globo and Grupo Bandeirantes—major TV networks in Brazil—are fighting to sponsor the annual congress of the Brazilian Association for Investigative Journalism. And Publica is now up and running. The response to the leaks also demonstrated that, more than twenty-five years after the end of military rule, the Brazilian public is ready and eager to advance toward a more transparent and accountable society. Brazil’s “Cablegate” generated a much-delayed debate about the lack of transparency in government and the need for a Freedom of Access Law. Journalists’ associations ramped up their demands for such a law to be adopted at once. Fernando Rodrigues, who was a director of the Brazilian Association for Investigative Journalism, wrote an article criticizing how slowly the law was being debated in Congress. When the president of the Senate, José Sarney, declared that documents should remain secret because “we cannot do a WikiLeaks of Brazilian history,” he was heavily criticized. President Rouseff signed the Freedom of Access Law on November 18, 2011. It took effect May 16, 2012—a date that could become a historic landmark for Brazil’s political culture—and the law is already being used widely by reporters investigating government-related stories. Indeed, the real legacy of Brazil’s WikiLeaks experience will be its impact on the country’s journalistic community. It showed that investigative journalism exposing the secretive inner workings of government and advancing the cause of transparency is not only critical but also exciting and cool. Today, it is clear that a vibrant investigative media can provide substantive information to the Brazilian public—who want to know and have the right to know. Natalia VianaNatalia Viana is a founder and director of Publica, Brazil’s first nonprofit investigative journalism center (apublica.org). She was a partner of WikiLeaks in Brazil.